I received this book free on Audible.com. Growing up in a home without television our annual tradition was to listen to Classic Radio comedies and dramas. AM 1600 (a station out of Ann Arbor) would play holiday episodes of Fibber McGee and Molly, Jack Benny, Duffy’s Tavern, The Life of Riley and always a dramatic representation of “A Christmas Carol.” The audio play format of [easyazon_link asin=”B00R2D5T9U” locale=”US” new_window=”default” nofollow=”default” tag=”rabidreaders-20″]Christmas Eve, 1914[/easyazon_link] fits perfectly with the story. It took me mentally back to that time of sitting on the floor in front of the radio with my brother listening to these engaging and entertaining shows. Emmy winning author and journalist, Charles Olivier, chronicles a little known and deeply poignant moment in world history. A time in history when opposing forces came together in the spirit of a holiday. Olivier’s story perfectly conveys the manic nature sometimes inherent in such tense situations. Narrated by Cameron Daddo, James Scott, Xander Berkeley, Damon Herriman, Cody Fern and Nate Jones, the voice acting called to mind other wartime dramas and was convincing as period piece. I am no expert of dialect but am impressed at the skills of the voice actors in the piece. While I didn’t know the actors by voice, I certainly recognized some of them by sight looking into their biographies. Their talents translated beautifully to the ear and their acting styles adapted to paint a word picture of the scene. [easyazon_link asin=”B00R2D5T9U” locale=”US” new_window=”default” nofollow=”default” tag=”rabidreaders-20″]Christmas Eve, 1914[/easyazon_link] is my first experience with an audio book in many years. I enjoyed the convenience of being able to listen to it while at work and also while cleaning at home. [easyazon_link asin=”B00R2D5T9U” locale=”US” new_window=”default” nofollow=”default” tag=”rabidreaders-20″]Christmas Eve, 1914[/easyazon_link] is beautifully written, wonderfully acted and just a joy to hear. I highly recommend this work for anyone interested in history or audio plays. It is free now on Audible. 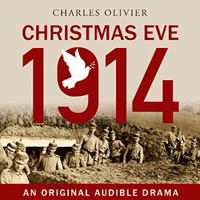 Listen to the first minutes on Christmas Eve, 1914 by Charles Olivier on Amazon.